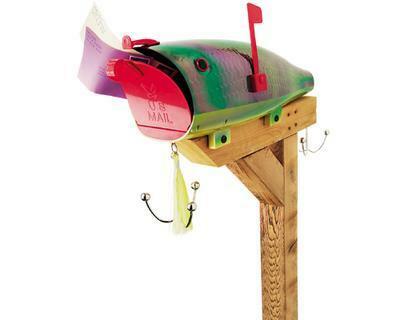 Fish Lure Mailbox Hooks are a bendable plastic and mailbox look just like fishing lure! Hooks are a bendable plastic and mailbox look just like fishing lure! Now your bills can sleep with the fishes!! This great mailbox is made of a high impact ploy resin. The bright metallic finish has been certified with UV approval to hold up to sunlight and extreme weather conditions. 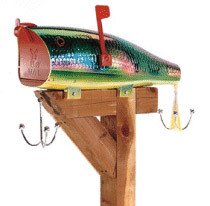 To complete the look, the Fishing Lure mailbox has two suspending hooks. But hooks are a bendable plastic. Designed to fit a standard 2" x 4" or 4" x 4" post (not included).